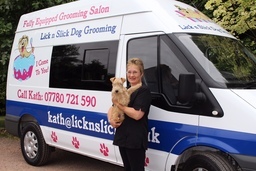 Professional Mobile Dog Grooming - The Salon that Comes to You Lick n Slick Mobile Dog Grooming was set up to provide a professional grooming service at your own home or even place of work to remove the stress and inconvenience of dropping your beloved pet off at a salon and having to pick them up again later. Your best friend will be in familiar home territory and more at ease knowing you are close by. You can relax in your own home knowing that your pet is being given exclusive pampering and TLC right outside your door. My mobile salon is fully equipped with a heated hydrobath, turbo blaster/dryer and electric grooming table. Why Groom Your Dog ?